The Michigan Nature Association is hosting the Moose on the Loose Family Fun Run & 5K this Saturday, August 26, 2017 in Marquette, MI. This event is a great way to show support for responsible conservation efforts and wildlife management in Michigan! 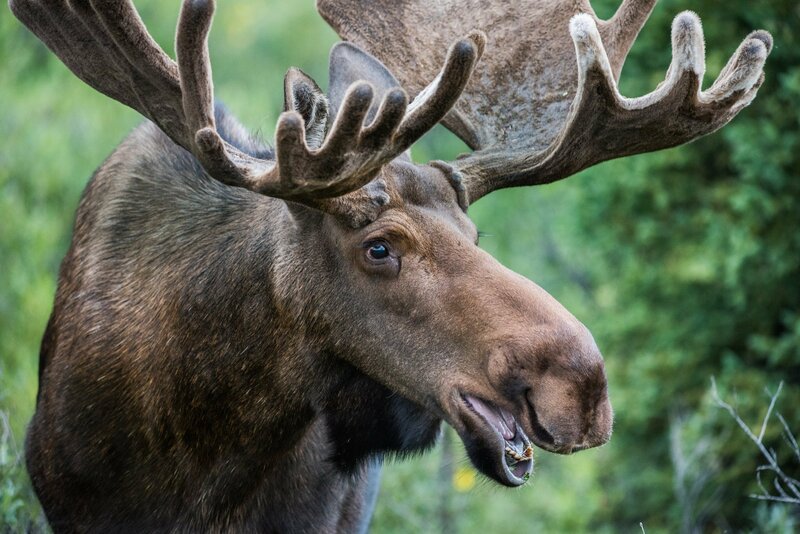 After European settlers arrived in Michigan, "moose were pretty much all over" the state, said Rachel Clark of the Michigan History Center to Michigan Radio. Following this, Michigan's moose population declined as a result of overhunting and habitat destruction from human settlements and logging. Eventually, moose mostly disappeared from the Lower Peninsula. Moose are currently found in two areas of the Upper Peninsula: the reintroduced population in Marquette, Baraga and Iron counties, and a smaller remnant population in the eastern UP, found primarily in Alger, Schoolcraft, Luce and Chippewa counties. According to the Michigan Department of Natural Resources, the most recent moose population survey of January 2011, an estimated 433 animals in the western Upper Peninsula were counted. No formal survey of the eastern U.P. moose population has been conducted, but estimated at about 100 animals from field observations and reports from the general public. Moose populations in the Upper Peninsula have risen and fallen in recent years, and despite a rise in western U.P. populations, moose are still in need of habitat management and protection, including a balanced relationship with their natural predators, like wolves. Populations have declined on Isle Royale, but dwindling wolf populations to a single pair of adults has allowed moose to thrive, as considerations to import wolves to the island are being made to maintain predator-prey balance and vegetation growth for moose diet. While currently listed as a "species of special concern" the US Federal Government considered adding the moose back on the Endangered Species List last year, as this status does not afford the animals or their habitat any protections, and nearly 60% of Minnesota's moose population has declined in the last decade. Past attempts to repopulate the Upper Peninsula with moose, which involved shipping moose to the mainland from a large moose herd on Isle Royale, failed to restore previous numbers but succeeded in establishing a moose population, largely due to healthy habitats and increased poaching enforcement, even as poaching threats were low as citizens of the Upper Peninsula were involved with the repopulation project and had adopted the new moose population as their own. In an interview with MLIVE, DNR Wildlife Division chief Russ Mason said moose populations are declining for a variety of reasons, which include habitat loss, predation and climate change, and because moose are conditioned to live in cold climates, warmer temperatures are putting all moose at risk of overheating, which leads to malnutrition and comprised immune systems. This summer MNA celebrated Michigan Mammals Week by exploring interesting facts on native Michigan wildlife, including the moose! For more info on Michigan moose, visit the Michigan Department of Natural Resources website. The Moose on the Loose Family Fun Run & 5K will be a must for moose and wildlife enthusiasts and families! Participants will have the opportunity to run along the scenic roadway of Peter White Drive on Presque Isle, a 323 acre forested oval shaped headland/peninsula which juts into Lake Superior! For questions, contact Jess Foxen at (866) 223-2231 or jfoxen@michigannature.org.